China Medical University is located at Shenyang, Liaoning province. 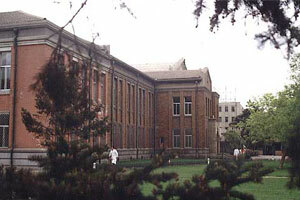 It was the first medical school established by the Chinese Communist Party. It was the only school that had finished the entire 12,500 kilometer Long Marchwhile persisted in running the school. It was also one of the earliest schools that delivered college education of western medicine in China. The predecessor of the university was the Military Medical School of the Chinese Workers and Peasants Red Army. It was founded in October of 1931 with the approval of The Central Military Commission in Ruijin of Jiangxi province which was the birthplace of the Provisional Central Government of the Soviet Republic of China. It was the first medical school established by the Chinese Communist Party. He Cheng, Chief of the General Military Medical Department of the Central Military Commission held a concurrent post as the principal. The opening ceremony was held in Yudu, Jiangxi province on February 22nd, 1932. Comrade Mao Zedong formulated the principles of firm in political belief, outstanding at technical skills and Commander-in-chief Zhu De made a speech. In October 1932, the Central Military Commission approved to change the name of the school to the Health School of the Chinese Workers and Peasants Red Army. In October 1934, as part of the division directly subordinated to the Military Commission, the school left Ruijin to join the famous 12,500 kilometer Long March and carried out rescue works while persisting in running the school, which makes a record unparalleled in history in both the histories of Chinese Communist Party and medical education of peoples army. In December 1935, the school arrived at the north of Shaanxi province and started running in Wayaobu. In January 1937, it moved to Yan'an and in August of the same year changed its name to the Health School of the Eighth Route Army. The school marched to the anti-Japanese front line with General Health Ministry. The faculty and students took active parts in the rescue work in Battle of Pingxingguan and Battle of Yangmingbu. 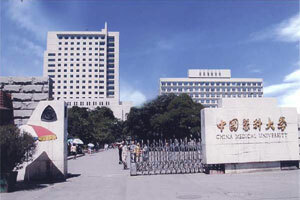 In September 1940, proposed by Comrade Mao Zedong and approved by Central Committee of Chinese Communist Party, the school changed its name to China Medical University. In 1941, Comrade Mao Zedong wrote for the first graduates of China Medical University (14th graduates since the establishment of the school) the inscription -Heal the wounded, rescue the dying, and practice revolutionary humanitarianism. This inscription has since become the action guide for CMU people and ultimately become the motto for all medical workers of the country. In November 1945, under the instructions of the Central Committee of Chinese Communist Party about establishing and consolidating northeastern revolutionary base, China Medical University pushed upwards to the Northeast from Yan'an. In July 1946, it arrived at Xingshan, Heilongjiang province(present Hegang city) and absorbed Northeast Military Medical University (former Harbin Army Medical School). 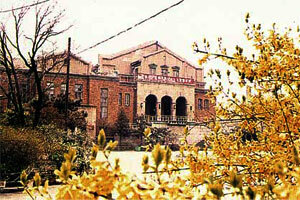 In January 1947, it absorbed the Medical College of Northeast University and part of former Harbin Medical University and in 1948 it established four branch schools with the first and second branch schools later developed into present Harbin Medical University, the third branch moving back to university headquarter and the forth branch developed into present Chengde Medical College. In November 1948, the whole northeast of China was liberated and the university was ordered to move to Shenyang. It absorbed and took over the former national Shenyang Medical School (formerly known as the Manchuria Medical College established by the Japanese South Manchuria Railway in 1911) and the former private Liaoning Medical College (formerly known as Mukden Medical College, founded by the United Presbyterian Church of Scotland in 1883). In October 1952, according to the decision of the State Department of Education on the adjustment of departments, the school of pharmacy separated from the CMU and formed a new school as Northern-East pharmacy school (present Shenyang Pharmaceutical University). In August 1954, China Medical University was put under the administration of national Ministry of Health. In September 1956, China Medical University changed its name to Shenyang Medical College under the instructions of the State Council, but regained its name China Medical University in January 1978. In 2000, the university started to be administrated jointly by Liaoning province and Ministry of Health of PRC; In December 2015, the university became a co-constructed university by Liaoning provincial government, National Health and Family Planning Commission and Ministry of Education. China Medical University has fostered and educated more than 90 thousand senior medical professionals since its founding. Its graduates are all over China and many other countries and regions, many of whom have become senior leaders in national health management and famous medical experts. At present, CMU is authorized to grant doctoral degrees in 6 primary disciplines, which are Basic Medicine, Clinical Medicine, Biology, Stomatology, Public Health and Preventive Medicine, and Nursing. It also has five national key academic disciplines and one national key academic discipline in cultivation, 40 national key clinical specialty construction projects of National Health and Family Planning Commission, 6 first class distinctive disciplines of universities and colleges in Liaoning, 7 mobile post doctoral stations and 21 undergraduate specialties. China Medical University is now facing unprecedented development opportunities. The faculty and students will work together and dedicate themselves to striving to build a first-class national medical university with a worldwide reputation.